(Phys.org) —Light traveling in a vacuum is the Universe's ultimate speed demon, racing along at approximately 300,000 kilometers per second. Now scientists have found an effective new way to put a speed bump in light's path. 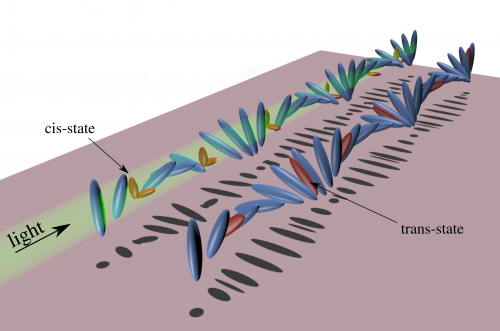 Reported today in The Optical Society's (OSA) open-access journal Optics Express, researchers from France and China embedded dye molecules in a liquid crystal matrix to throttle the group velocity of light back to less than one billionth of its top speed. 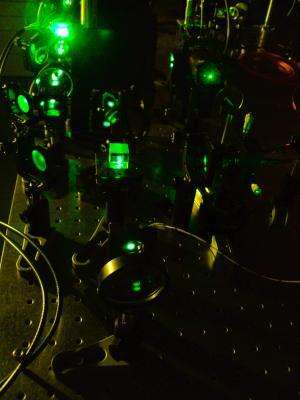 The team says the ability to slow light in this manner may one day lead to new technologies in remote sensing and measurement science. The new approach to manipulating light, conducted by a group from France's Université de Nice-Sophia Antipolis and China's Xiamen University, uses little power, does not require an external electrical field, and operates at room temperature, making it more practical than many other slow light experiments. Putting the brakes on light can help scientists compare the characteristics of different light pulses more easily, which in turn can help them build highly sensitive instruments to measure extremely slow speeds and small movements, says Umberto Bortolozzo, one of the authors on the Optics Express paper. In a second paper, also published today and appearing in OSA's journal Optics Letters, Bortolozzo and colleagues from the Université de Nice-Sophia Antipolis and the University of Rochester describe an instrument that uses slow light to measure speeds less than one trillionth of a meter per second. Scientists have known for a long time that a wave packet of light becomes more sluggish when it travels through matter, but the magnitude of this slow-down in typical materials such as glass or water is less than a factor of two. "The question is: can we do something to the matter in order to make light slow down much more considerably?" says Bortolozzo. The key to achieving a significant drop-off in speed is to take advantage of the fact that when light travels as a pulse it is really a collection of waves, each having a slightly different frequency, says Bortolozzo. However, all the waves in the pulse must travel together. Scientists can design materials to be like obstacles courses that "trip up" some of the waves more than others. In order to exit the material together, the pulse must wait until it can reconstitute itself. Other research groups have manipulated the properties of atomic vapors or crystal lattices to significantly slow light and, under certain circumstances, to temporarily "stop" it inside the medium. Bortolozzo's team instead used a liquid crystal similar to the materials used in LCD television and computer displays that could operate in a simple setup, does not require external voltages or magnetic fields, and works at room temperature and with very low optical power. They added a chemical component that twisted the liquid crystal molecules into a helical shape and then added dye molecules that nestled in the helical structures. The dye molecules change their shape when irradiated by light, altering the optical properties of the material and hence changing the relative velocities of the different wave components of the light pulse as it travelled through. 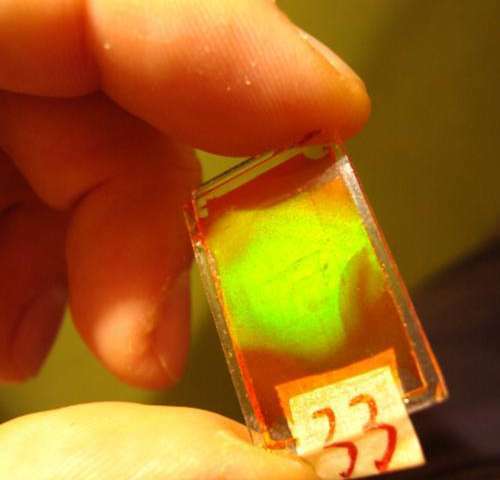 In addition, the helical structure of the liquid crystal matrix ensures a long lifetime of the shape-shifted dyes, which makes it possible to "store" a light pulse in the medium and later release it on demand. Although one of the ultimate goals of slow light research is to find a way to slow and store light pulses for optical communications, the long length of the light pulses used by Bortolozzo's team make such an application impractical. However, Bortolozzo says the team's technique is well suited to sensing and interferometry applications. In the Optics Letters, paper Bortolozzo and colleagues demonstrate how slow light can be used to build a highly sensitive instrument that works on a principle similar to the concept behind a police officer's radar gun. Radar guns catch speeders by detecting a shift in the frequency of radio waves (called a Doppler shift) that can be used to determine a car's velocity. Bortolozzo's team used slow light to detect a very slight Doppler shift in a pair of light beams. The approach "allows us to measure extremely low speeds in only one second of measurement time," explains Bortolozzo. He says a next step will be for the team to test their dye and liquid crystal slow light approach in similar phase sensing applications. The team will also endeavor to extend the work to other molecular arrangements and different types of dye. "Realizing slow and stopped light in these media is very exciting both for the fundamental research that discovers such new effects in soft matter systems, and for the new possibilities that these investigations could open in the fields of remote sensing and optical storage," says Bortolozzo.